“When the party pledge on equity, people perceive that we are planning to strip wealth off the wealthy section of the people and distribute it with those less fortunate, but this is not what we plan to do.” He said equity means providing equal opportunities for everyone without any discrimination. “For instance, if we achieve better economic growth, everyone will be benefitted from it. That is why we aim to achieve national economic self-reliance by 2025,” which the party president said will be achieved by focusing on hydro projects and promoting sustainable tourism. “Nevertheless, during PDP’s tenure, despite such measures, we did not face any rupee crisis,” said Tshering Tobgay, and solicited justification from the DPT President on why such an issue arose during their tenure. 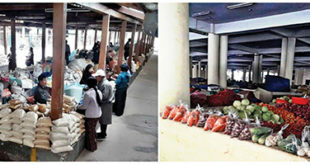 The President of Bhutan Kuen-Nyam Party (BKP) also raised similar doubts on the economic self-reliance by 2025. 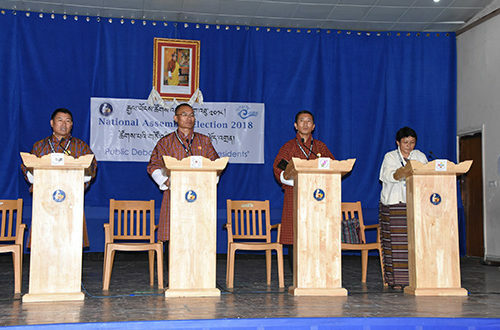 Responding to the queries from the three party presidents, Pema Gyamtsho said that it would be unfair to judge the performance during their tenure as the ruling party based on the rupee crisis in 2013. He said the Asian Development Bank presented Bhutan as the fastest growing economy in the Asian region. “The rupee crisis in 2013 should be attributed to the increase in the number of major hydro projects being initiated, and increase in construction activities during that time. We constructed thousands of kilometers of roads, which is the very reason the PDP government was able to distribute Boleros to every gewog.” The DPT President that PDP was able to achieve the economic progress as it complemented the plans and projects that was initiated during DPT’s tenure. “DPT reduced the poverty in general from 20.4 percent to 12 percent. The poverty rate in the rural areas also decreased from 32 percent to 16 percent during our tenure, due to construction of gewog roads and rural electrification, which is all about promoting equity in the society,” said the DPT President. power to all the relevant agencies, and most importantly to the local government. Tshering Tobgay said that the Nu 2 mn grant provided to the local government annually has been utilized very well, which has led to several developmental activities around the country. He said that people are now seeking accountability and transparency on the utilization of the gewog development fund which is a positive sign. “After observing that the gewog development fund has been utilized to the optimum, PDP, if elected, promises to increase the grant to Nu 5 mn in the 12th FYP. Moreover, we also plan to provide additional Nu 20 mn to identify projects and utilize accordingly,” said PDP President. 2012 when the country was still reeling under the impact of the rupee crisis. During that period, Rupee reserves fell to INR 1.5 bn. 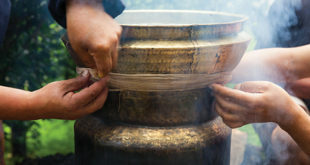 “For Druk Nyamrup Tshogpa, the unequal distribution of wealth is a major concern, which if neglected, could mean a wider gap. When we say narrowing the gap, people should not be misled into thinking that we’ll devoid the wealthy people the opportunities of growth and create opportunities only for the poor. We only mean that if people become rich because of their talents, hard works, knowledge or inherent skills- we will support such individuals to further grow rich. At the moment we are of view that the wealth is concentrated in the hands of few people because of the discrepancy in some of our policies,” said the President of Druk Nyamrup Tshogpa (DNT), Lotey Tshering. According to the DNT President, the gap in providing equal health services is very wide right now, and he pledged to narrow such gaps. He announced that it is important for the people to elect a new government during this election in order to narrow the gap between the haves and have-nots before it is too late. Responding to the PDP President, Lotey Tshering said that the former government should have solicited critical feedback from the public on the rural services instead of focusing only on the positive side of the story. Lotey Tshering said that DNT will continue the projects and schemes initiated by PDP and give due credit to them instead of boasting of it as their success. The party president also said that people at the decision making body have been oblivious to such gaps in availing health services, and it never occurred to them to come up with any solutions to solve one. “If we continue to be ignorant or oblivious to such prevalent gaps in proving health services to our people, the life expectancy of people in rural areas are bound to drop. When I stress more on the health issue, it is not because I’ve a medical background, it is because bringing such issues to the forefront has huge benefit to the people from the rural walks of life,” he added. The President of BKP, Neten Zangmo, said that the party including all the coordinators and supporters have pledged to never engage in corrupt practices, which she said, creates income disparity, favoritism, nepotism among others, and leads to the loss of trust in the system. She argued that the foundation of democracy in Bhutan is not very strong because there is fear among the people to speak out freely. Neten Zangmo said that corruption is quite rampant in politics, and thus appealed to all the political parties and people to refrain from engaging in corruption and to report corruption practices to the authorities in order to build a strong foundation of democracy in the country. She alleged that some people in rural areas had been misled into thinking that people would know whom they voted for. She called upon people to ask questions to themselves.